In Europe, it is the conviction of the “brightest and the best” that is loosing anarchy upon the world. Yeats’s poem “The Second Coming” captures reality in Europe these days, although surely not in the sense the poet intended. In Germany, the popular press is captivated by the face-off of the stern German Finance Minister Wolfgang Schäuble, clad in black suit and tie and white shirt, against the “charismatic,” “heartthrob,” new Greek Finance Minister Yanis Varoufakis, bald head, dress shirt unbuttoned and untucked, scarf draped for effect. Only the appearances are deceiving. The buttoned-up Schäuble is the ideologue, with doctrine blinding him to reality. The rakish Varoufakis is the pragmatist, seeking a sensible way out of a catastrophe. In Europe, it is the conviction of the “brightest and the best” that is loosing anarchy upon the world. In Europe, it is increasingly clear the center cannot hold. 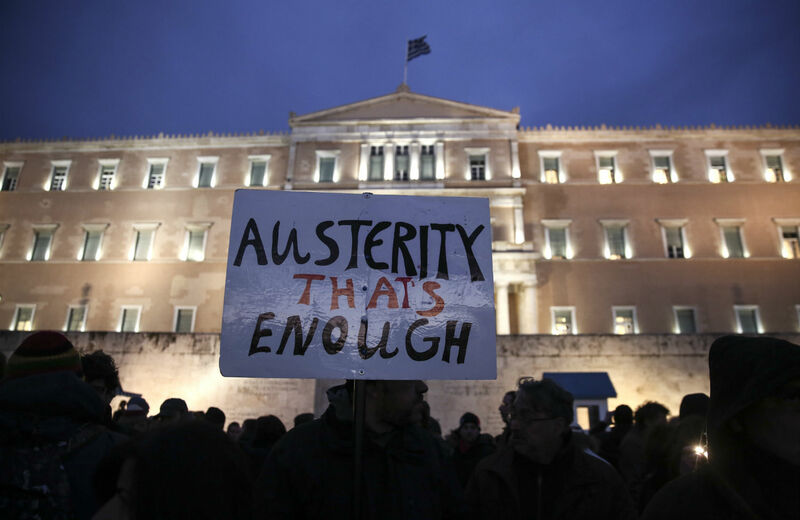 The austerity inflicted by the “troika”—the European Union, the International Monetary Fund and the European Central Bank—on the debtor nations of Southern Europe—Portugal, Ireland, Italy, Greece and Spain (dubbed the PIIGS by pundits)—has failed disastrously. Citizens in Greece, Spain, and elsewhere suffer unspeakable misery to repay debts that grow ever more impossible as their economies crater. The “responsible” center-right and center-left parties that dutifully sought to enforce the cruel dictates have been discredited. Parties that promise an end to the austerity are gaining momentum. The Greek people elected Syriza last month—a party forged out of a “coalition of the left” of fringe Marxist parties, greens and various social movements. Syriza’s leaders call not for revolution but for sensible reform. Greece would stay in Europe and would repay its debts. The new government pledged to run a primary surplus but not the crippling surplus of 4.5 percent GDP as required by the troika. Syriza also promised to do what no center party dared to do: crack down on corruption and tax avoidance of the Greek oligarchs who have plundered the country. It urged that debt repayment be made affordable, linked to the rate of growth, so that if the economy falters, the debt payments will adjust. It took steps to end the fire sale of the nation’s assets and to supply electricity and food to all.